The walking tour starts with a walk through the cellars of the Diocletian’s Palace that are still very well preserved. The cellars offer a good view at how the life in the Palace was organized. Once we go through cellars we will come out to Peristyle square where Cathedral of St. Duje (patron saint of the city) is placed. The Cathedral is built on the remains of an ancient shrine and is supposed to be the oldest in the world. A visit will be made to the charming Temple of Jupiter. 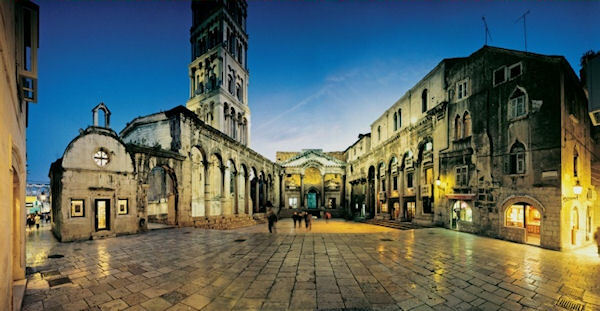 On our walk through the narrow streets of Diocletian palace we will see Golden Gate, the Silver Gate, the Peristyle Square etc. After the walking tour the guests can visit the colorful open market (largest on the coast) or spend some time in the town on their own. Leaving Split you will drive along the Dalmatian coast until you reach Trogir which is located on a small islet between the mainland of Croatia and the island of Ciovo. It was originally a Greek colony but the main core of the town was developed between the 13th and the15th centuries, when the town was surrounded by city walls. The historical center of Trogir is a unique monument of culture and is on the UNESCO’s World Heritage List. You will walk with your guide through its narrow streets, taking you back in history as you pass stone houses, churches, palaces, monasteries, and city walls. You will stop at the main attraction of Trogir, the St. Lawrence Cathedral. Take time to enjoy the beauty of the Romanesque portal created by the local artist Radovan. It is considered as the cathedral's finest piece of architectural work in Dalmatia and features lion figures on the sides and the figures of Adam and Eve above them. Please note: This tour requires you to be able to walk approximately 500 meters over cobblestone and flat terrain and take up to 50 steps. Remember to bring your camera. Please note: This tour requires you to be able to walk approximately 500 meters over cobblestone and flat terrain and take up to 50 steps. Unfortunately the Diocletian Palace portion of this tour is not wheelchair accessible. Tour is considered as moderate activities tour. Guests should wear comfortable shoes and light clothing.